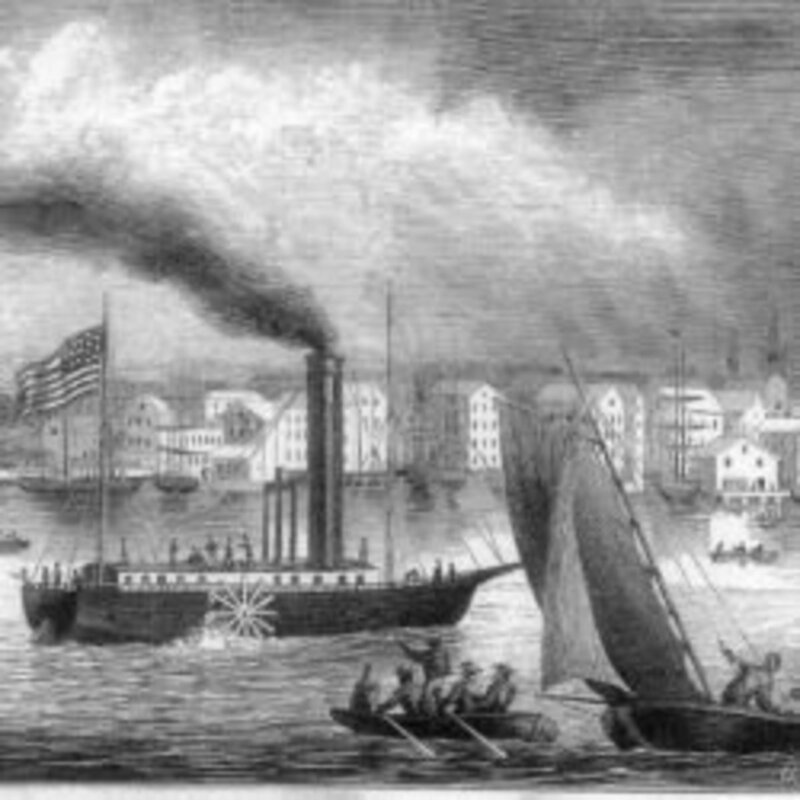 In the early days of this country, ferries and barges were adequate for the transportation of goods and people across streams and rivers. Smaller streams were simply forded and places where streams could be forded were common knowledge. As the population grew and trade increased the need to transport larger numbers of people and heavier goods in a faster and more secure manner led to the development of bridges. These first bridges were simply logs stretched across supporting timbers. The span of the bridge was limited to the length of the supporting timber, or stringer. As the builders of bridges became more astute they began to utilize trusses, arches and joined stringers to create bridges with longer spans. One of the things plentiful in 18th century America was wood and these bridges were made almost entirely of wood. It soon became apparent that the joints of a wooden truss bridge were deteriorating rapidly when exposed to the elements; so rapidly that the bridges were lasting only 10 to 20 years, sometimes less. 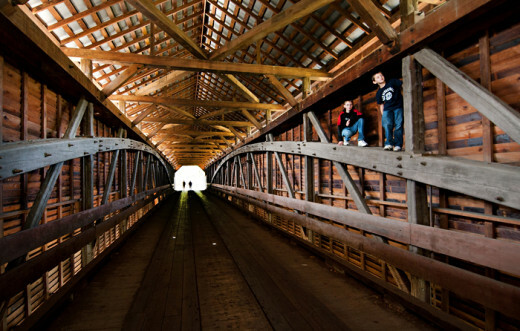 The covered bridge was devised in response to the need to protect wood trusses and joints. The first American covered bridge was built by Timothy Palmer in 1800. His bridge spanned the Schuylkill River at 30th Street in Philadelphia. Palmer did not intend for his bridge to be a covered bridge but the investors were insistent that he design it covered in order to extend the life of the bridge and protect their investment. The value of the covered bridge design was quickly realized and all wooden bridges being built were being built covered. Thousands of wooden covered bridges would be built in the 19th century. While covering bridges did extend the life of the bridge and decrease maintenance costs there was a downside. When it snowed sleds and sleighs were the primary methods of transportation, snow had to be shoveled back onto the floor of the bridge to provide a snowy surface for the runners. The vast majority of America’s covered bridges were built between 1825 and 1875 and, by the 1870s, most of the bridges being built were covered at the time of construction. Taxpayers were agreeable to municipalities taking on the expense of building the bridges since they had been paying the ferry owners to cross the rivers and streams. The free crossings coupled with the longevity now provided by the covered bridge made the construction costs palatable. 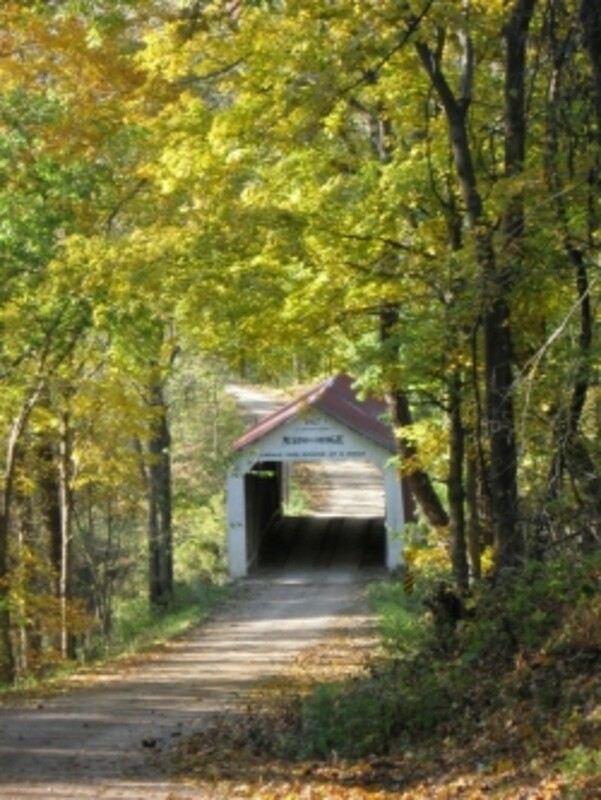 More than 12,000 covered bridges have dotted the American landscape with Pennsylvania having the most. Between 1820 and 1900 at least 1,500 bridges were built in Pennsylvania and, today, of the 880 surviving bridges in America, Pennsylvania has the largest number with 227. In many instances the covered bridge came to be a local gathering place. Typically it would be the largest open area under roof in any community and would be used for political rallies, religious meeting, town meetings, weddings, and even dances. Obviously it was also, simply, just a good place for a traveler to get out of the weather. The longest covered bridge in history was the PennsylvaniaRailroadBridge which spanned the Susquehanna River at Columbia, Lancaster County, PA. Over 1 ¼ miles long the bridge was set on 26 stone piers and was constructed from timber salvaged from a previous bridge that had been destroyed by ice. The bridge not only served the railroad but also carriages, pedestrians, and wagons. The bridge was burned by state militia on June 28, 1863 to block elements of the Confederate Army from crossing into LancasterCounty shortly before the Battle of Gettysburg. There is a great deal of controversy regarding the age of the older extant covered bridges. Many of these bridges have unsubstantiated dates of construction and several bridges are vying for the status as the oldest in the country. Whatever their precise construction dates there are several wooden covered bridges still standing that were constructed in the first half of the 19th century. These bridges are much older than any made of concrete or steel. The only things that predate covered bridges in this country are some of the stone arches that support them. The typical covered bridge uses heavy timber trusses to carry loads over an obstruction. The floor system spans between the longitudinal trusses, and distributes and carries the loads between those trusses. The bridge is completed by lateral bracing connecting each truss, a wall system, and a roof to prevent weathering. The main purpose of the roof is to prevent weathering but it also serves as an additional method for tying all of the elements of the bridge together. Where bridge construction varies and is the most obvious is in the style of truss. There are a multitude of truss styles, the oldest is the Kingspost and the most common is the Burr arch. 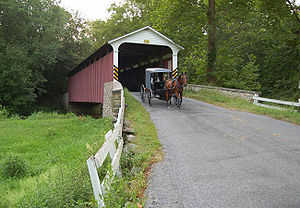 Of the extant covered bridges in Pennsylvania more use the Burr arch truss design than all of the others put together. One of the earliest and most prominent bridge builders in America was Theodore Burr. He built his first bridge over the Hudson River in 1804 using his arch truss design. His truss uses two long arches resting on the abutments on either end that typically sandwiched a multiple kingpost structure. 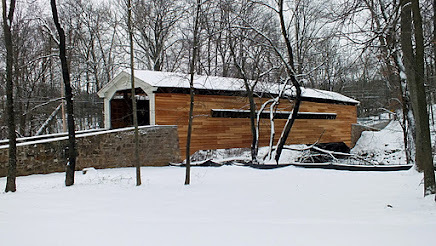 His design quickly became the preferred method of constructing covered bridges. 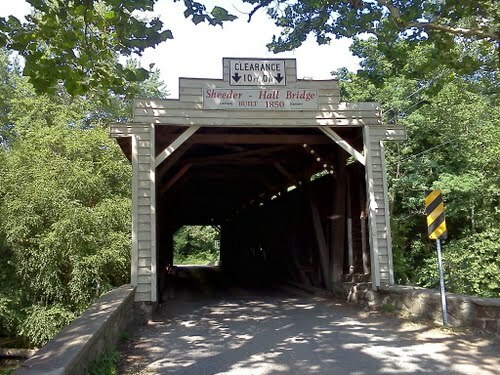 The great majority of covered bridges crossed streams, usually with a single span. However, the first crossings of the major rivers were accomplished with multiple span covered bridges. However, the heavy traffic loads and wildly fluctuating water levels made for relatively short life-spans for those magnificent bridges. In addition, the close proximity of the covered bridge to water caused special problems related to accelerated deterioration due to rot, as well as the ever-present danger from floods. Therefore it was the river bridges that were the first to be supplanted by iron and steel bridges. 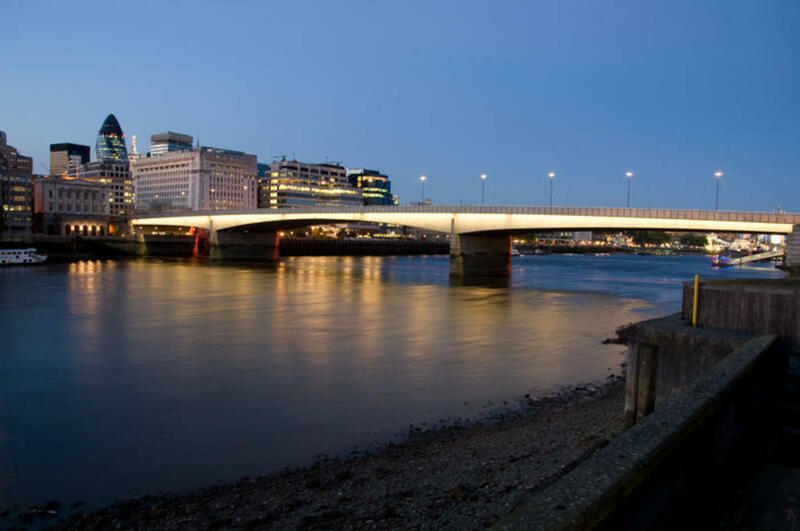 However, builders began to use a combination of iron and wood trusses on the smaller bridges to make them better able to withstand occasional high, fast currents. Covered bridges were built to carry a single, narrow lane; most bridges are 14 to 16 feet wide. There were a few “double-barrel” bridges built in the 20th century but only 6 remain active. Covered bridges obviously were built for much slower moving traffic than today’s automobiles. 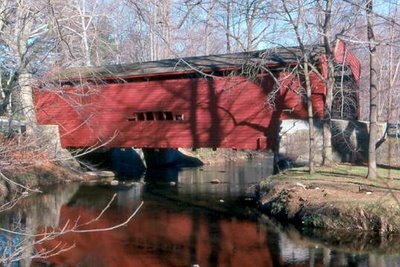 Typically covered bridges were built at naturally narrow spots in the stream, and at right angles to the flow, to minimize the span length. Since trails, cart paths and eventually roads tend to follow streams this means that many covered bridges have at least modest curves at both ends of the bridge. are both curses and blessings. In many instances the bridge is out of tolerance with modern traffic and is functionally obsolete. More bridges have been replaced for this than any other reason. On the other hand, these same two conditions have contributed to the bridges’ longevity. The single-lane bridges limited the amount of load that the structure had to support at any one time and the curves slowed traffic. Slower traffic means fewer bouncing vehicles and fewer accidents that could damage the bridge. The height of a covered bridge is also a factor. The clearance is generally much lower than typical iron and steel bridges and while it is helpful to the health of the bridge it is disruptive to traffic patterns. Much of the damage to bridges is done at the portals where oversize vehicles have tried to make their way onto the bridges. This restricted vertical clearance clearly contributes to the functional obsolescence of the covered bridge. Many people associate covered bridges only with New England and a very few other States. Interestingly, there is at least one covered bridge still standing in 30 States. Pennsylvania has, by far, the most, with 227 surviving examples. This is followed by Ohio, with 143; Vermont, with 100; and Indiana, with 93. Those States with only one surviving, authentic covered bridge are: Minnesota, New Jersey, and South Carolina. Very good and informative article. Loved the picture with the horse and buggy. Here in my area we have a few bridges that have been restored and one left that you can still drive over. There is only one in my home state of Minnesota It's in the small town of Zumbrota. My husband and I visited it last year to take pictures. You've done a very informative history of covered bridges here. There are some in Illinois that I am aware of. 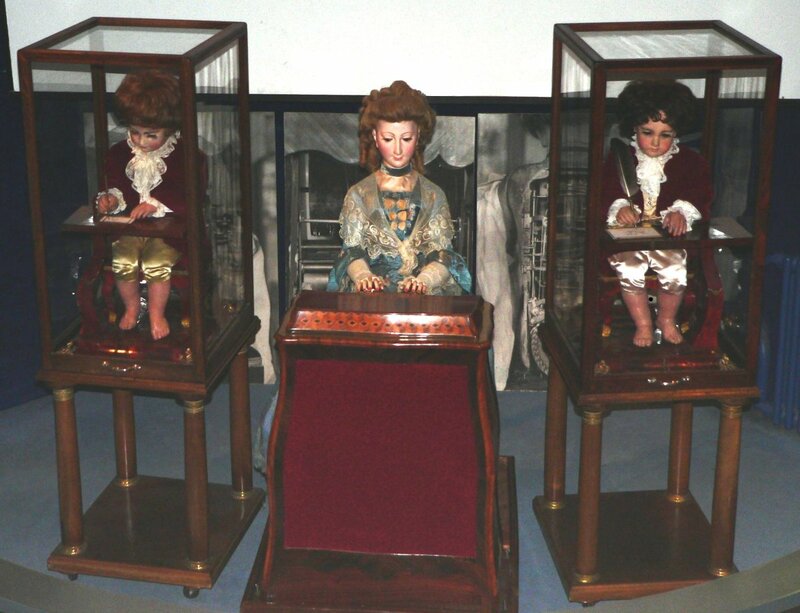 some others that I have seen in the Midwest(not in use anymore) I can't recall the location of. I do like the looks of them. sharing with friends.